The design of affordable housing schemes have been pretty much the same everywhere – a few high-rise blocks that look like pigeon holes, a high density of small apartments with the typical 2-bedroom or 3-bedroom layouts. It has been the same plain look for the longest time and budget-tight buyers are often left with no choice but to accept the banal offerings. However, Malaysian Institute of Architects (PAM) president Ezumi Harzani Ismail points out that the typical design of affordable houses actually prohibits a healthy living and social environment and will become costly for their occupants in the long run. “When affordable housing price is lowered by the use of cheaper and lower quality materials or cheaper contractors, more maintenance needs to be done in the long run,” he says. Furthermore, affordable housing schemes are usually located at the fringes of towns and residents would have to spend more time and cost on commuting to work compared with if they were to stay within the town. “In the end, people own a house that does not increase in value but is costly for them to live in. The house price may be cheap but the cost of living is high after taking into consideration the long commute, the poor maintenance and the unhealthy environments,” he tells EdgeProp.my. Hence, a development that provides a conducive living environment within an easy and quick commute to work and business, should be the model for affordable housing, Ezumi posits. Hence, he urges policy makers to look at enabling integrated or mixed developments to be built to give more live and work opportunities for residents as this will ultimately result in better household incomes and better housing affordability. Besides the proximity to workplaces, the building design is also key to the success of an affordable housing project, notes PAM Council member Ang Chee Cheong. He says the current design of affordable housing does not meet the needs of the people and it is causing affordable housing to be unpopular due to the unattractiveness of such schemes. “Affordable housing is not being done right and the system and mechanism of provision is not a good one. You are just building to satisfy a statistical number and the responses are not optimum,” he points out. Another issue is the rise of small-sized homes which Ang believes do not offer a conducive living environment for the owner. “A house is more than just four walls, floor and ceilings. You need to have a certain amount of sizing. We are very much against the idea of micro-housing because we don’t believe it solves any problems by forcing people to live in 300 sq ft apartments. We are not Hong Kong, New York or London, so we shouldn’t go there,” he says. The design and quality of affordable housing projects, he says, can be improved by adopting innovative ideas. “I think [the design] can be substantially improved and this is where we can demonstrate innovative design solutions for a variety of sites to tackle current challenges,” offers Ang. Ezumi says the industry needs to shift into a new era of affordable and sustainable housing development where the homes may not be as cheap as before, but are socially, economically and environmentally sustainable. At the recently concluded Kuala Lumpur Architecture Festival 2018 (KLAF2018), PAM gathered some of the most creative minds in the architecture industry to showcase several future housing prototypes aimed at addressing the issues surrounding the affordable housing sector. Here are four innovative design ideas featured at KLAF 2018. 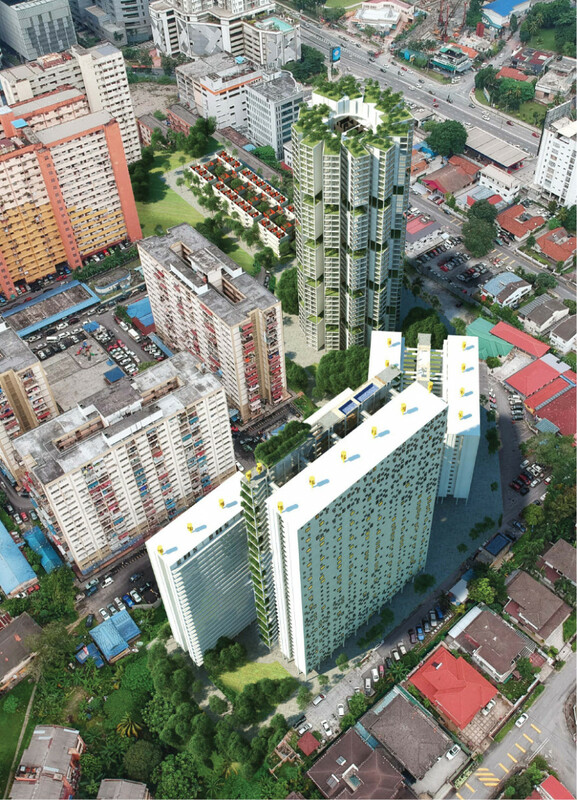 A design by DP Architects Sdn Bhd features the possibilities that a modular high-rise home can offer the housing sector. 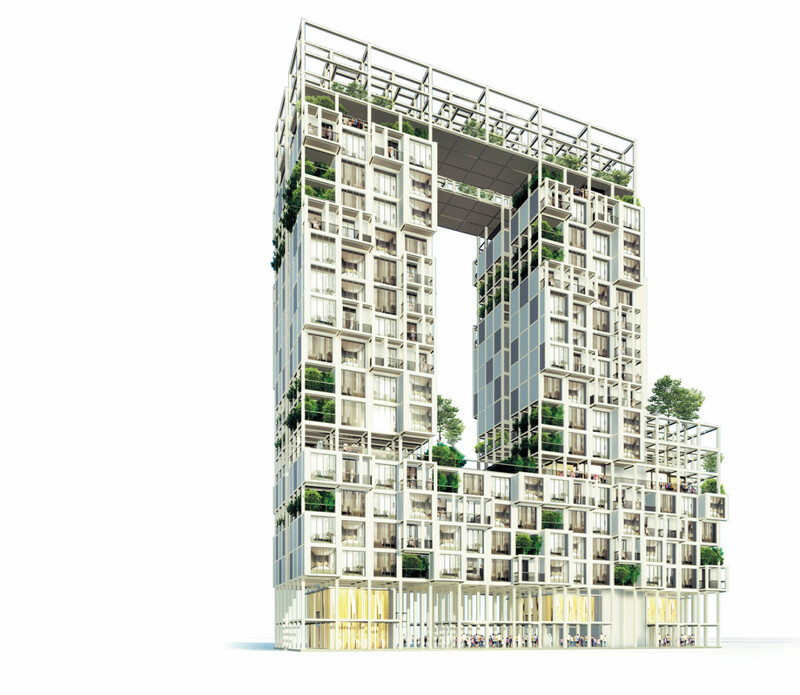 The architectural firm proposes to adopt the concept of modularity, where the design of each unit is based on a module that can be combined with other modules to create larger homes for bigger families based on the life cycle of residents. Besides responding to the different housing demands according to the residents’ growth and economic situation, this concept is expected to optimise cost, construction time and resource management of the building. It allows for the evolution and improvement of housing in the medium to long term, providing good living conditions for residents without large upfront costs. 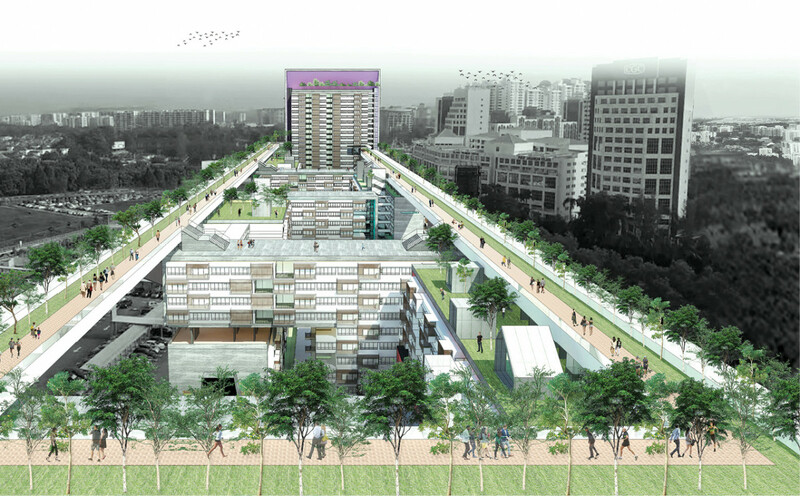 O2 Design Atelier Sdn Bhd has come up with a forward idea to address the issue of land scarcity in urban areas by building mass affordable housing on the space above existing highways. Without the need for land acquisition, a big part of the cost could be used for building better quality homes. The firm has chosen a stretch of the Sultan Abdul Aziz Shah Airport Highway, a major highway in the dense Petaling Jaya area where housing demand and price are high to demonstrate the idea. The proposed housing project is integrated with a mass transit station while featuring car parks, communal gardens, sports facilities, a landscaped deck and retail space in the building on top of the highway. Incorporated in the idea are innovative mini wind turbines installed at the flanks of the highway. These turbines, fed by the rapid speed of zooming vehicles on the highway, will generate energy to power the running of common facilities of the building. The turbines, along with planted trees, also act as noise and air pollutant diffusers. Polluted air from the traffic below will be brought up through a tunnel with wet scrubber filters that eliminate pollutants and subsequently clean air is released into the podium facility area. CY Chan Architect believes shophouses in urban areas can be an alternative affordable dwelling typology to meet the needs of middle-income urban dwellers and offset the lack of affordable housing available within urban areas while creating a balanced, inclusive, sustainable community and liveable city. The firm proposes to build 2-bedroom apartments on top of 2-storey or 3-storey shophouses that have become redundant due to changes in the economy by using 3m by 6m steel framing grids which tower over the shophouses as a support system. Each of the apartments are composed of lightweight walls and pre-cast floor slabs for easy construction, which will reduce the overall construction cost and grant flexibility for future expansions. 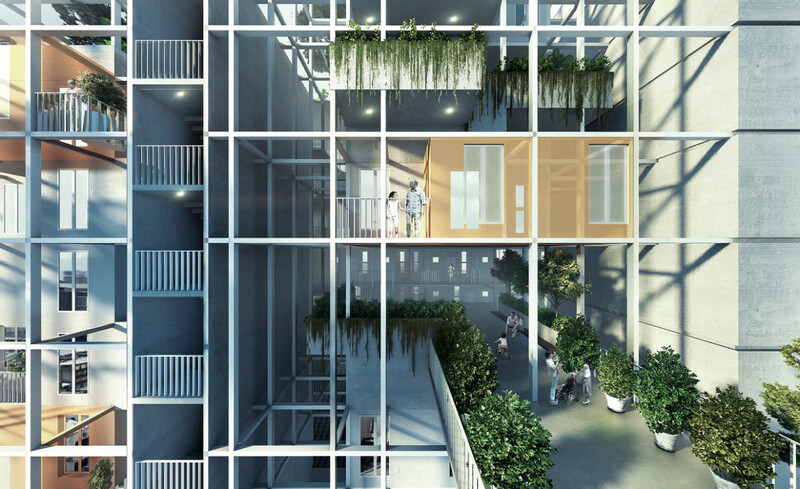 The design of the apartments also introduces an expandable housing concept which features a 3m setback on each building facade to allow for future expansions based on the families’ needs. The shophouses at the bottom, on the other hand, can serve as a housing lobby or a venue for residents to conduct daily activities. 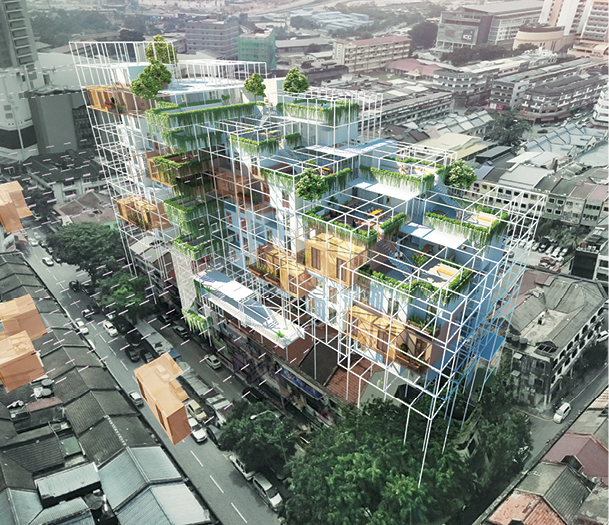 One proposal brought up by Konzepte Asia Sdn Bhd is a spiral high-rise building with the units on each floor spread out like flower petals. The design allows each unit to enjoy good ventilation and natural lighting while offering a conducive living environment for the residents. Common facilities such as the community hall, green areas, playgrounds and eateries are on the community levels. Through these designs, the architectural firm hopes to begin a dialogue of creating housing that is meaningful and is able to strengthen communities and empower its inhabitants.